The company P&B Foods Ltd., is the largest importer of Asian food products in the UK, has awarded AR Racking the contract for the racking required for its new warehouse in the new ProLogis Park Bradford Yorkshire. P&B Foods has been operating in the market since 1967 as an importer of popular food brands from the South Asian, Caribbean and Chinese markets. It is one of the largest wholesale distributors of oriental foods in the UK and across Europe, with significant growth leading to the recent relocation and expansion of its facilities and product range. The Adjustable Pallet Racking and Drive-In Racking supplied and installed by AR Racking stands in a building built and fitted-out by GMI Construction PLC. It is an important logistics hub for P&B Foods with a delivery service of no longer than 3 days lead time in the UK and Europe and is aimed at improving it’s customer satisfaction, efficiency and competitiveness. 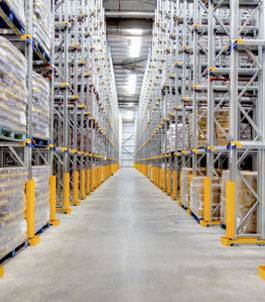 The AR Racking team, specialists in industrial storage solutions, has designed, planned and installed a system tailored to the needs and the volume of activity of the company now and for the foreseeable future. 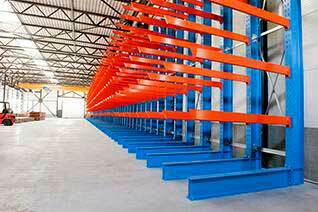 The solution combines two storage systems that meet different needs; A reach truck operation of Adjustable Pallet Racking with a capacity for 15,190 pallets and a Drive – In system that can accommodate up to 6,622 pallets. In total, it has capacity to house 21,812 pallets, storing among other products, herbs, spices, lentils, flour, different types of rice, pickles, cooking oils and various sauces. 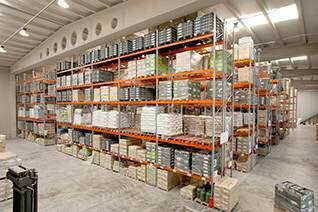 The Adjustable Pallet Racking is perfectly suited to this application where 100% selectivity is required, for the high stock rotation and strict stock control. 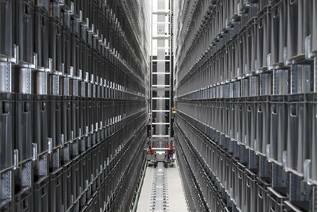 The Drive – In Racking is used for storing large quantities of the same products on pallets and therefore very effective use of the available cubic capacity of the warehouse. Forklifts drive into the storage cube to place and pick up full pallets and in this instance reverse out, (First In Last Out) but Drive – In Racking can be Drive – Thru (First In – First Out) given appropriate circumstances and needs. The close collaboration of the AR sales team and technicians with P&B Foods has resulted in a custom-built installation for the storage and retrieval of full and part pallets of products for all of the company’s customers. As Mr. Singh points out "Having the expertise of these specialists in storage has enabled us to optimize the warehouse operations and make improvements, offering a more competitive service, in line with our growth strategy."